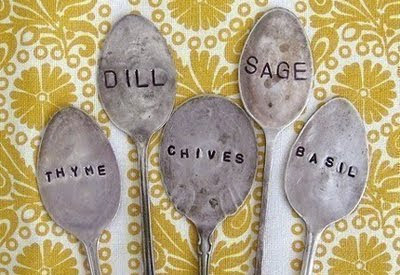 As neat as the vintage spoon markers are, it seems a shame to hide the prettiest part in the dirt! 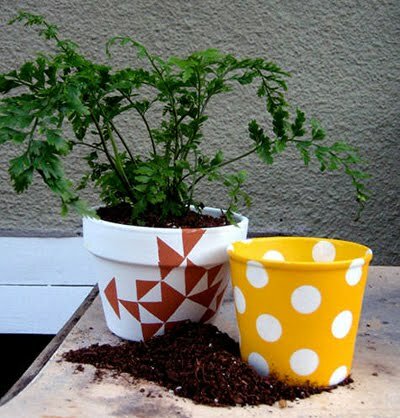 These are some very cool garden projects! Thanks for sharing! Thank you very much; I've added it to the post! I love the spoons! So cool! Love those spoons and the bird feeder...awesome! I read the title and thought you were going to give us gardening tips! Well, I guess you 'sorta' did. :) I love the teacup feeder! Wow! Thanks so much Jess for adding us to your blog! You rock! Oh I love all of this! So cute. Thanks for sharing! In case you hadn't seen this already: Your print on wall. that teacup idea is so clever! I loved this idea! I asked the spoon artist if he could do a custom combination, and within hours, he had the exact set I asked for as a listing. How wonderful! I think they'll make great gifts for my mother-in-law. That's a great idea! Now just have to find some nice vintage spoons! Wow - thank you so much for including my stamped spoon tutorial in this great list!!! That teacup bird feeder is just darling! So very excited about gardening season! Thank you for sharing! Oh!! I like so much the tea cup! I want one!!! Ya know! 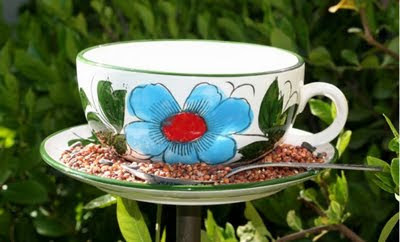 I'm thinking a painted or tarnished spoon glued to the cup and saucer makes a great perch for the birds. oh i adore the tea cup and saucer idea - genius! Those are brilliant garden projects. They would probably add style and beauty to every garden. Thank you for those inspirations. That tea cup is so freakin' adorable! Spoon are really very nice.I love tea cup also.